Sorry for the lack of updates. Haven’t really had much time to do anything. We’ve had family come from all over for the wedding that you’re about to read about (if interested) and there’s just been a lot of other things going on like putting my car away for the winter. Anyways – I think I have a handful of pictures to keep some content going for a little while. It may not be car stuff, but it’s definitely something worth blogging about. Whether it tickles your pickle or not is not my business. If you’re willing to stick around and read a bit and look at some fun pictures – you might get a little taste of the little differences an “Asian” wedding is compared to the ones you’re used to. 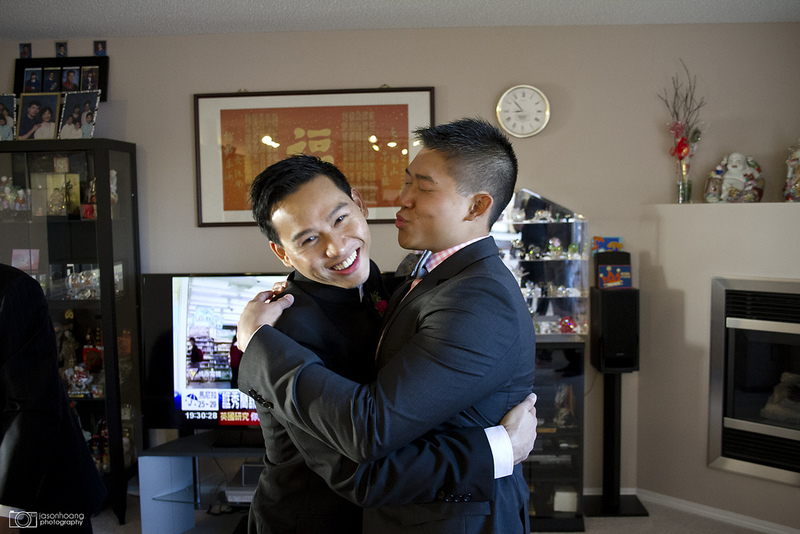 Anyways – on Sunday, September 30th 2012 was my cousin Richard and his wife, Wenlei’s wedding. Whenever a wedding comes up, there’s actually a lot of preparation that one has to go through to get ready for it – even if you aren’t part of the wedding. You need to find the proper attire, you need to make sure you’re dressed to the nines, and even the hours leading up to the day, you have to make sure your hair looks good, your clothes are ironed, and your makeup is did. While we probably weren’t under the same stress and pressure as Richard and Wenlei, I can say it was still a pretty hectic day. 8:00AM – Diana is getting ready and I’m hanging around sulking cause she’s taking forever. Girls always know they take forever, but they always wake up last. What’s your deal?! 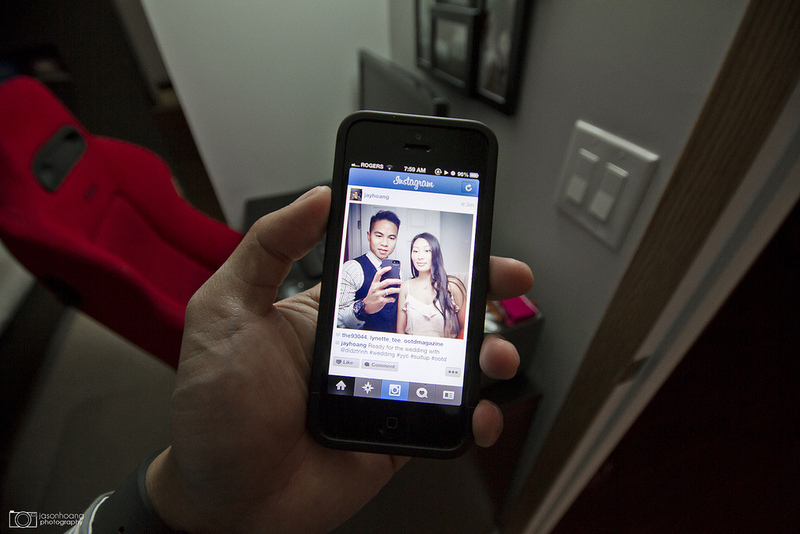 A quick Instagram photo before the day starts. Also while I was waiting for Diana to get ready. 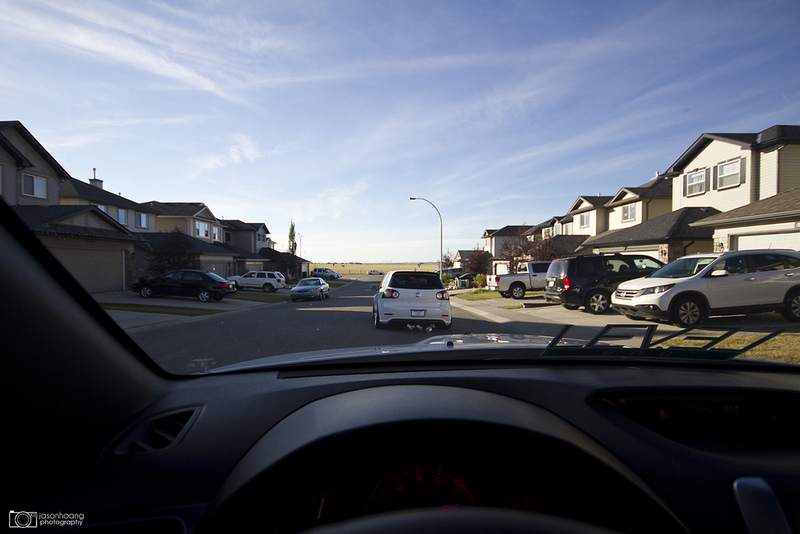 We arrived at Ricky’s house at 8:30AM – his car was all ready since he was the chauffeur for the day. 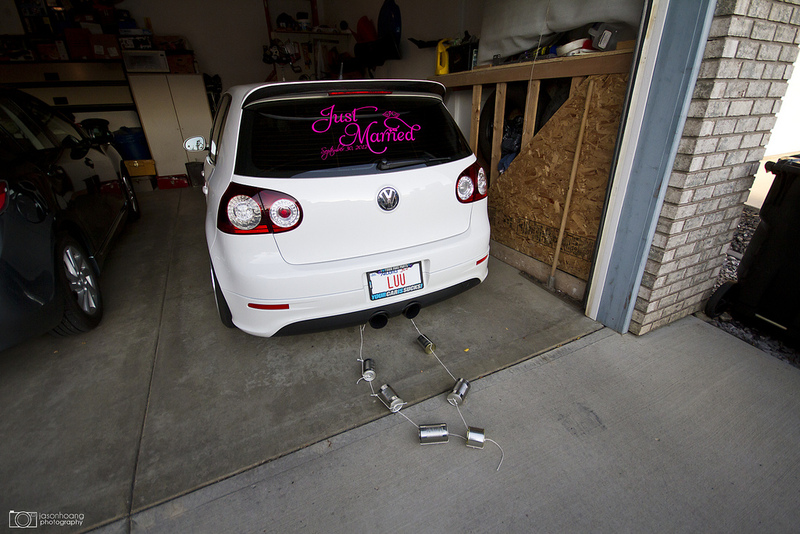 We placed the “Just Married” sticker on his rear windshield and they tied some cans to the rear of his car for some noise. Ring the doorbell and this stud greets us with his bow tie and all. Check out the groom lurking in the back. 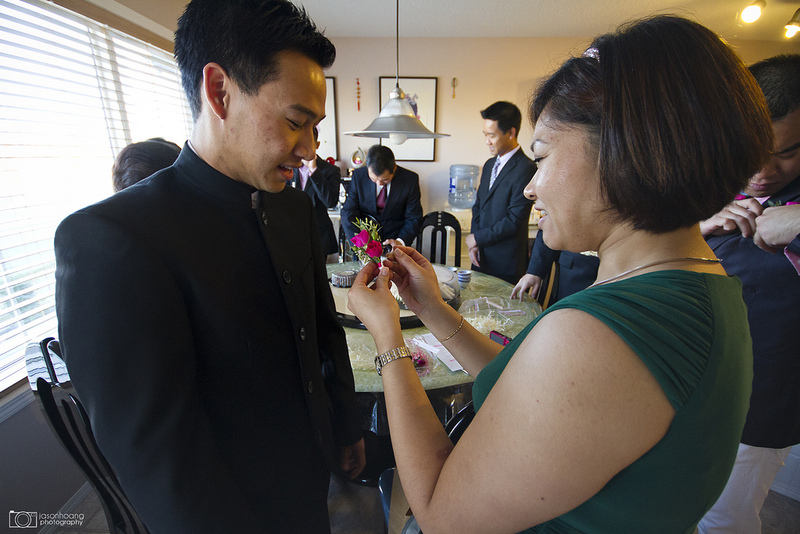 Leslie – Richard’s sister who flew in from Florida for the wedding, pinning the flower to Richard. 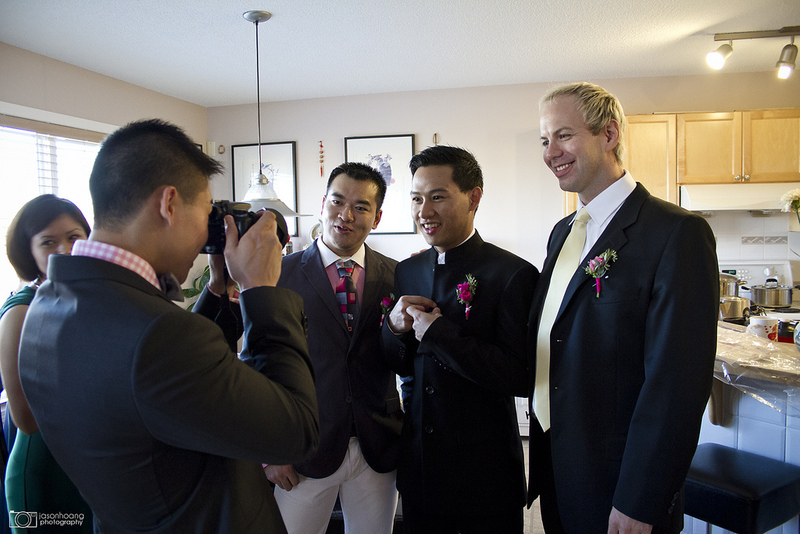 Ricky taking a shot of Richard, his brother Raymond, and his best man, Kevin. Ricky showing Richard some love. #nohomo here, guys. Anyways – we were chillin for a while because the makeup for Wenlei was a little behind schedule. I don’t remember what time it was, but we finally got the call that it was good to come over. We hopped in our cars and braced ourselves for some games. The cans at the back of Ricky’s car. 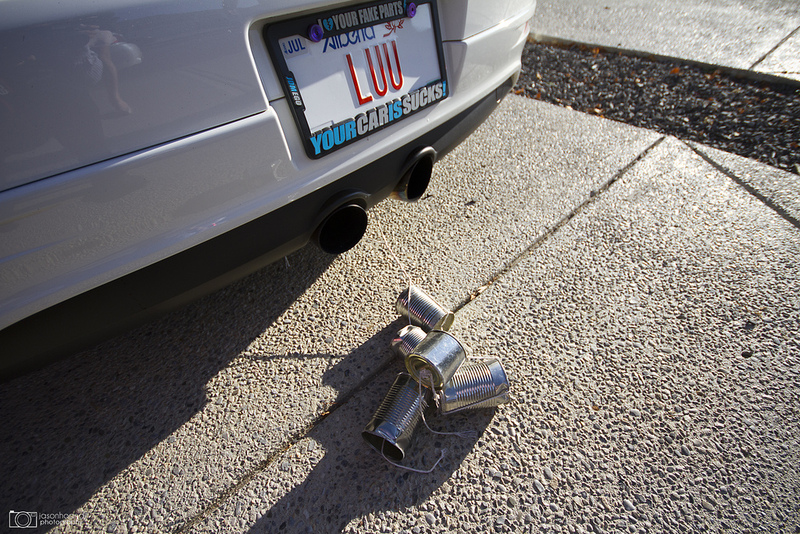 Louder than you think it is. Their place is really only about 3 minutes away and we didn’t even drive faster than 60km/h and the cans got pretty banged up. 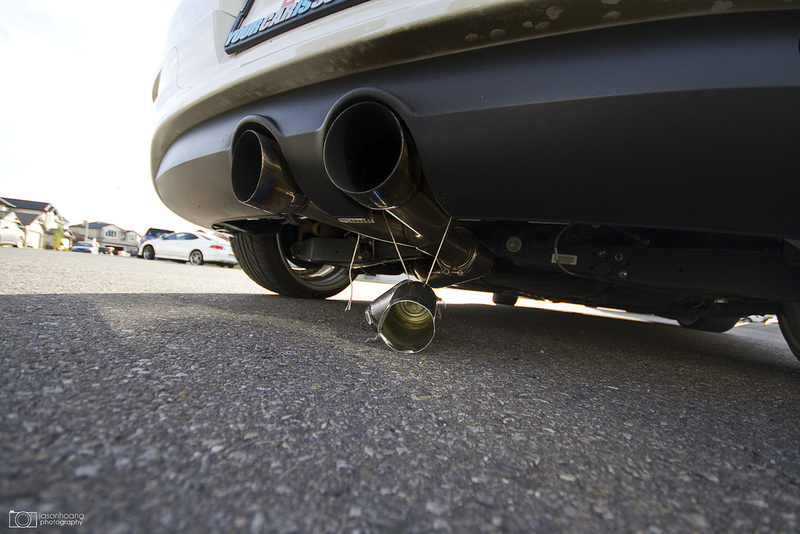 Even lost one on the way… Almost hitting my car. Here’s where it gets a little different. 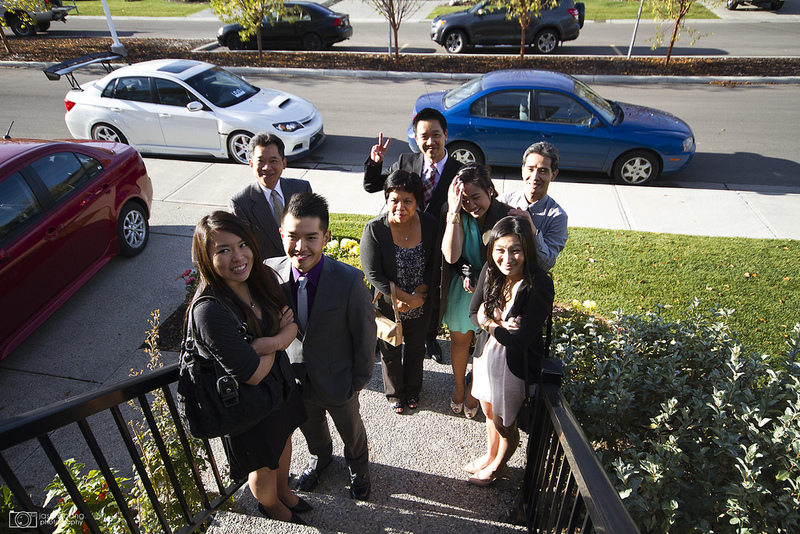 During an Asian wedding, when the groom goes over to the bride’s house – he is greeted by the brides family/friends and is required to pass a series of tests and games before he’s allowed to see her. It’s kind of a test, if you will, to see if the groom is ready and willing to take on all that is before him. The tests can be anything like questions about the bride, strength tests, eating tests – you name it. 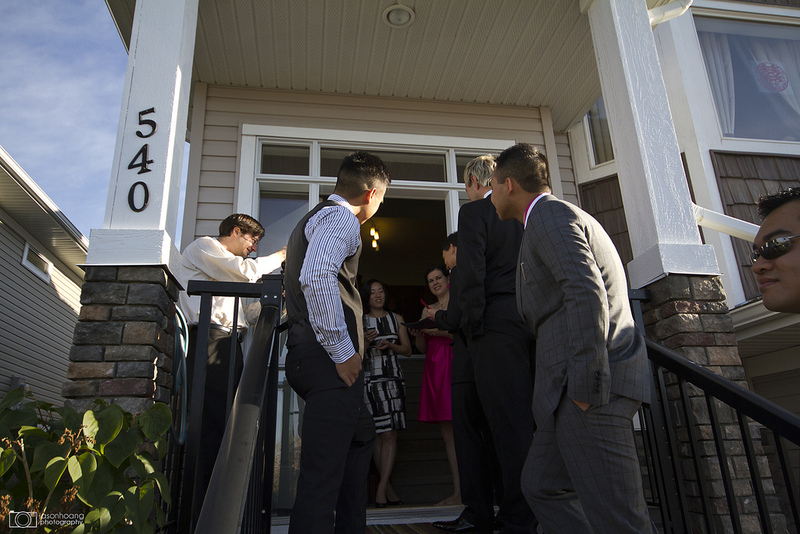 The groom can and should enlist the help of his friends/family to complete the tasks. If he or the party can’t complete the task, he has to pay up with red envelopes filled with money. The first test was a “food test” – 4 little cups with different types of food in them. Hot sauce, bitter melon, lemon, and honey. Anyways – it’s a quick taste of what a marriage is like. 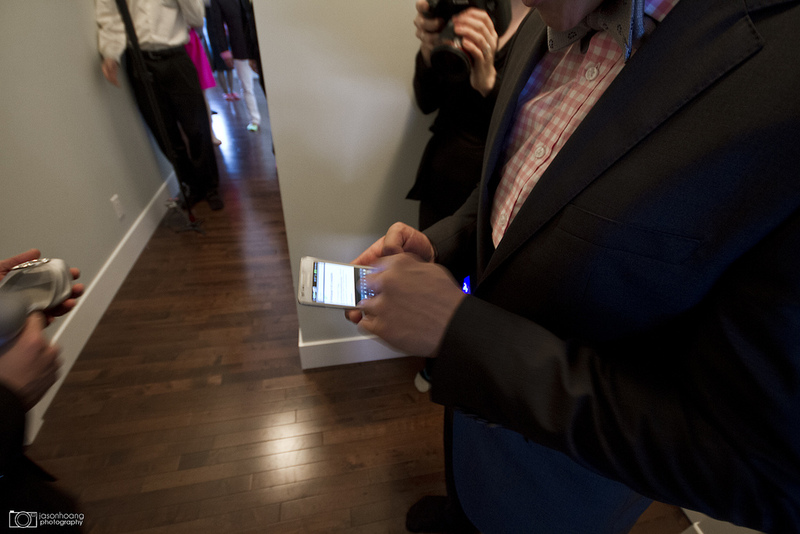 The party behind him waiting to see the results. One of the last tests was for Richard to find her misplaced shoe somewhere in the house in 2 minutes. 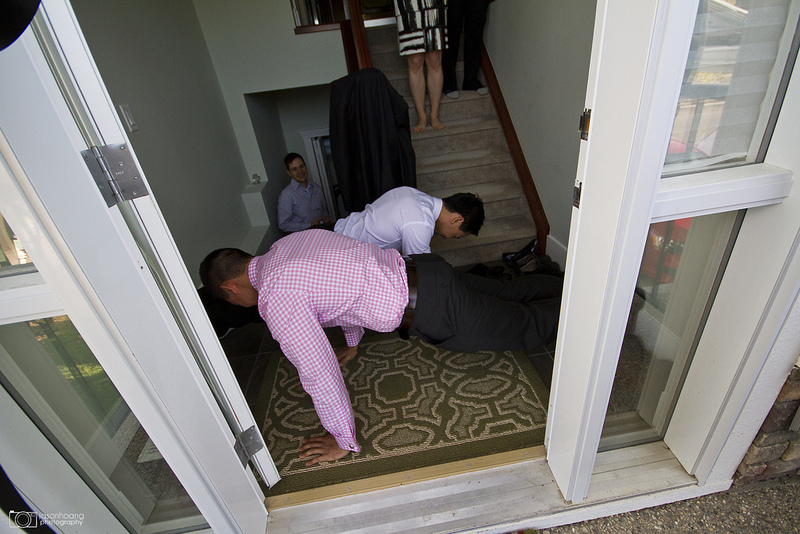 Unfortunately, they were unable to find it and they either had to pay up with those red envelopes or do 20 pushups. With the help of Ricky – they split it in half and finished that task. Finally – we were allowed in the house. Just when Richard thought it was over, he had one last test. To sing a love song before being allowed in. Ricky, Kevin and I rushed in to the rescue. I suggested Backstreet Boys – As long as you love me. Ricky pulled up the lyrics on the phone and we jammed out like it was 1999. Unfortunately, Ricky and I displayed our ability to sing the song far too well and ended up looking like girls. Doesn’t matter – the door opened. Richard placing the shoe on Wenlei’s foot. Finally after all the tests. What takes place after this is the tea ceremony for Wenlei’s parents. Richard and Wenlei serve tea to her parents and close family in exchange for their blessing. 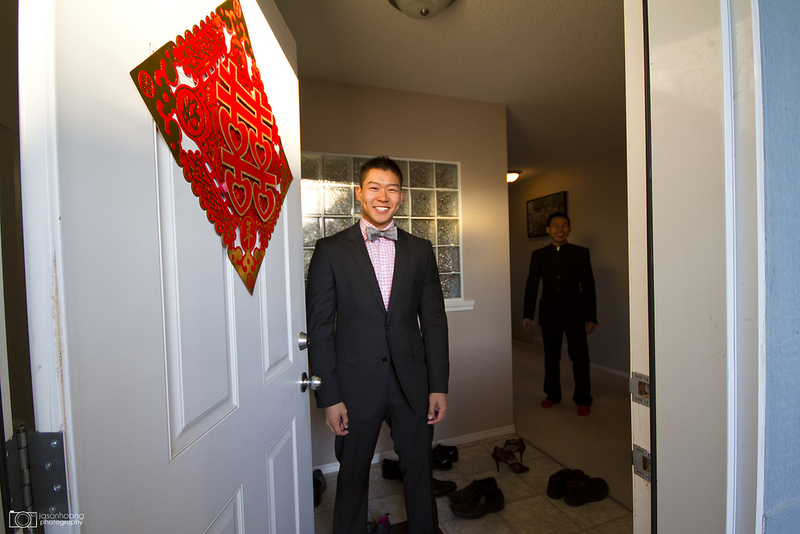 Ricky, being the gentleman that he is, opens the door for Richard and Wenlei. In return, Richard decides to give him a red envelope and pay him for his duties. Look how grateful he is. Richard fixing Wenlei’s collar. Note: It was a pretty nice day – a little windy but nothing to get in the way of the wedding. What ended up of the cans. Two left and all stuck under the car with a total of 6 minutes of driving. Maybe we’ll stick to pom poms next time? Anyways – the tea ceremony proceeded with our side of the family which I won’t bore you with. I’ll end it here because this is where we went to the restaurant, set up the little things, and got ready for guests. Stay tuned!